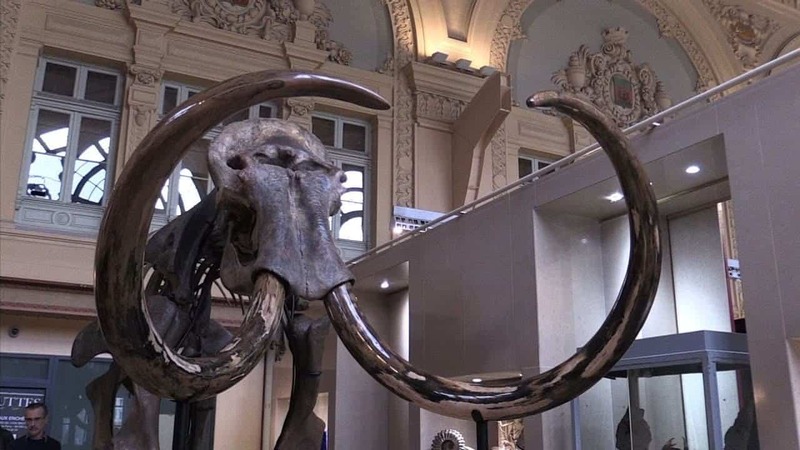 The CEO of a French waterproofing company just bought a woolly mammoth skeleton — 80% of which is original bone. If you’re looking for more unusual Christmas presents, know that it cost Pierre-Etienne Bindschelder, CEO of French-based waterproofing company Soprema, €548,250 (US $646,000) to buy himself a nice, full wooly mammoth skeleton at the Aguttes auction house in Lyon. Which, I think we can all agree, will definitely make for an interesting discussion topic around the holiday table. Bindschelder says he was motivated to buy the giant skeleton — mounted in a forward walking position, its enormous curved tusks with tones of caramel and ivory facing slightly downward — at least in part, by his line of work: his company’s logo is a woolly mammoth. The skeleton is the largest of its kind ever found, a male standing at more than 10 feet tall. It’s also of “exceptional quality”, being spectacularly well preserved and almost complete. It’s one of only a hundred mammoths of its species we’ve ever discovered, and it stands out through its imposing size and the quality of its tusks — each roughly 9 feet long, “weighing 80 kilos and 90 percent intact,” natural history expert Eric Mickeler told The Local France. It was unearthed roughly one decade ago by a hunter in Siberia, who found the bones sticking out from the permafrost. The once-in-a-lifetime find was made possible, in large part, by climate change — which is making Siberia’s permafrost thaw and melt at a very rapid rate. The other part is that mammoth bones are actually pretty abundant in Siberia, sometimes insanely well preserved. That bit at the beginning where I called this a ‘more unusual’ present? It’s not even an exaggeration; mammoth bone auctions take place more often than you’d believe. The first full mammoth skeleton to be auctioned off sold for US $176,000 in France in 2006. Another was sold in October 2012 in Paris for €240,750 at an auction organized by Sotheby’s. Then there was one in 2014, and, just last month, a ‘family’ of four such fossils failed to sell in the UK. Do you think scientists should retain control over fossils, in the name of furthering our knowledge, or should collectors be allowed to own such artifacts just because they can afford to pay up? Let us know in the comments.